While out walking I came across a cotton bush two streets over from our home. It does not look like the cotton plants that you see while driving through the southern states in the US but that is exactly what it is. This plant was about 8 feet tall and covered with little puffs of cotton. Above is an unopened pod. 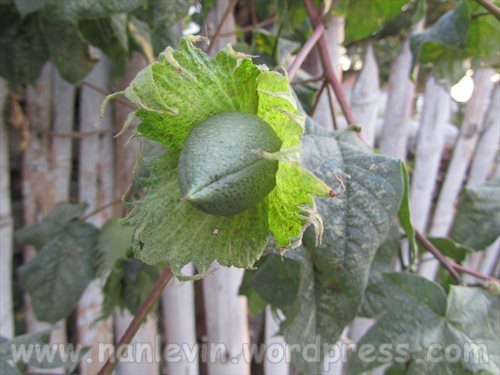 While out with Max visiting the finca I made him stop as I saw yet another cotton bush. He thought it was the stuff found in the ceibo trees. 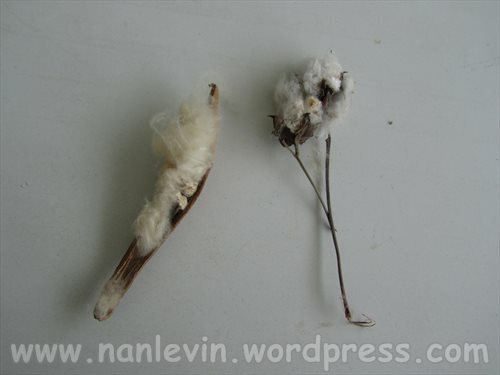 But actually it was both the cotton from a real cotton plant as well as the fluff found on a ceiba tree. Love to see nature up close like this. Now where’s my spinning wheel? 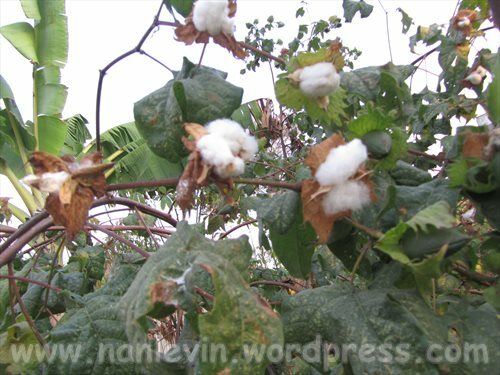 This entry was posted in Beach, Ceiba Trees, Cotton Bush, Ecuador, Farm (finca), Finca (farm), San Clemente and tagged Beach living, Cotton, cotton boll, cotton plants, Ecuador, Expats, San Clemente, South American by Nancy Levin. Bookmark the permalink. Deb, can you really see me spinning cotton…you are so funny…No I don’t see myself doing that but you would be amazed at just what I do do on a daily basis to live well…compared to living in the states, I am a regular pioneer woman!!! Nancy, That is so interesting. I am amazed. I wonder if cotton is or was ever farmed here. It is so awesome, after being here for over 5 years, I still learn something new about Ecuador each day. Always enjoy your commentaries. Great to have you blogging again! Best wishes to you and Joe for a healthy, happy, prosperous new year. it’s so ironic that we both photographed the cotton bolls tis past week! the december rains must have triggered new lok-at-me growth! Glad to see you back!! Always enjoy your posts! Nancy, we find the cotton pods from the ceibo tree everywhere. When they open, it’s like snow floating around in the sky. They used to stuff life preservers with the Ceibo cotton because it floats. I’ll bet the old life preservers on the ferry are still stuffed with Ceibo cotton. lol Beautiful pictures and comparisons. I agree! I even had a friend correct my grammar on one of my posts. jeje Today I learned that “irregardless” is not a word. I should have written “regardless”. I learn something new everyday. That’s one of the reasons I love to blog. Really neat- thanks for the pictures. I’ve visited a large cotton finca (10,000 acres) in Guatemala years ago. The plants were 8 feet or so tall. There is no way the cotton can be harvested by machine. The farmer had his own crop dusting plane, a gin and an oil mill. He hired several thousands at harvest time.